The Catholic War Veterans is a 501(c)(4) organization. All subordinate echelons (Departments, Chapters and Posts) are also 501(c)(4) organizations and must file as such. Donations to any of our Echelons are NOT tax-deductible. Those wishing to make a tax-deductible donation should be referred to our Catholic Veterans Service Foundation (CVSF). Click HERE to visit that website. Most Posts and some Chapters and Departments will need to file a Form 990 (ePostcard) if your average annual income is $50,000 or less. Click HERE for information about the Form 990N. Posts, Chapters and Departments with income greater than $50,000 will need to file a 990EZ or a 990. If your Post operates a canteen, you will need to file a Form 990-T. Click HERE for information on this form. Returns are due on the 15th day of the 5th month after your unit’s fiscal year ends. Filing Form 990EZ or Form 990 late will incur penalties. 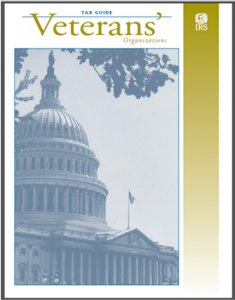 IRS Publication 3386 is designed to assist veterans’ associations that are either currently exempt or considering exemption status. The book discusses tax-exempt status, unrelated business income, deductibility of contributions, record keeping and filing requirements in order to aid these organizations in understanding and meeting their tax responsibilities. Click HERE or on the image on the left to read, download or print this publication.